In this week’s episode, we dismantled the idea that “working with men who have depression” and other such categories really qualify as niching. 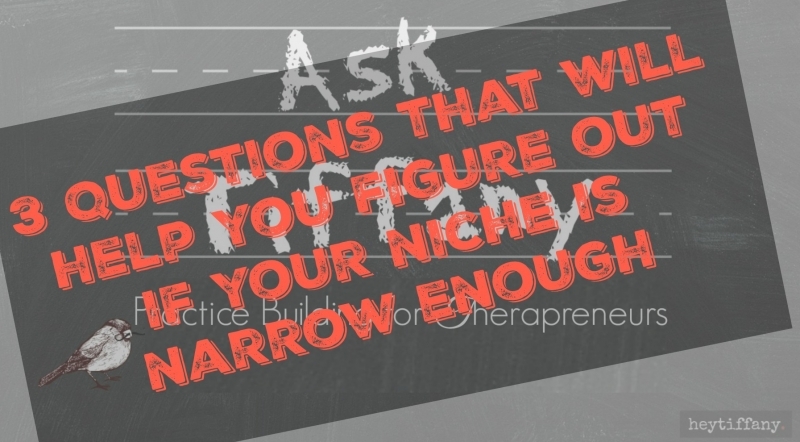 We’re going to dive deep and help you answer, “Is my niche narrow enough? !” by giving you three questions that you can ask yourself. Just randomly found your website searching for niche help–Love seeing you do your thing! Hey Tiffany! This video is amazing! I’ve never seen anything like this on a practice building site. Your content is incredible (obviously), but even more striking is your use of video editing and sound effects. So so so cool. I’m hoping to vlog for my practice website and you just set the bar at a totally different height for video creation. Thank you!!! Bethany! I’m almost thinking about blushing. Thank you!! Where is your vlog?! I’d love to check out your creations! Oh my gosh, you are AMAZING!! I love this! Thank you for sharing your wisdom. Kelly! You never cease to impress me!! I love to see how you’re continually challenging yourself to dig deeper! I might even ask you this… if your ideal client is the creative, visually expressive adolescent – who are you gearing your MARKETING towards? The adolescent?… or the parent of that adolescent?